I got a great bargain on the baby bedding for our shabby chic ballerina nursery online for just $80. From that point forward I just carried out the color scheme laid out in the pink and green baby bedding set that you see in our ballerina baby nursery pictures. After that, I chose our little ballerina's nursery decorations accordingly. We have many more shabby chic ballerina nursery ideas and DIY crafts projects for you. I also updated and re-purposed furniture to save money and add my own personal touch to the space. The design above the white chair rail on the wall was painted in shades of pink using a damask stencil pattern to make the pink portion of the wall in the nursery more decorative and interesting. I gave the white metal nursery chandelier shabby chic lamp shades by decorating plain white mini-shades with dried pink roses. 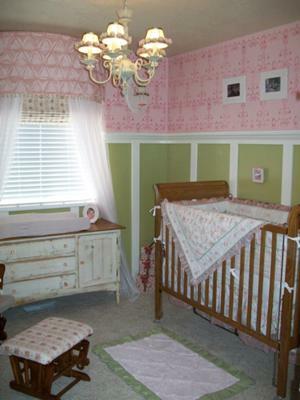 This gave the light fixture some color and matched the crib bedding beautifully. I gave the distressed dresser that I planned to use for this project an update by replacing the painted wooden knobs with pink crystal drawer pulls. I love the ballet and arranged Degas prints throughout the nursery. I planned to use a washable pink bath rug beside the crib but found it was too small. So I sewed the green border bring the rectangle up to size. Then I made my own Roman Shade for the windows that matched the baby bedding and reupholstered the rocking chair's stool with the same fabric. Please visit us again to see our latest Unique Baby Gear Ideas and more pictures of shabby chic nursery designs for baby boys and girls. Thanks for sharing your cute nursery pictures. I'm certain that our visitors will love your baby ballerina pictures. Could you please give a link to a tutorial for the distressed baby dresser? I would love to do something similar for my son but do not have a clue as to where to start or what I will need.